Information form with four tabs will be displayed: “General”, “Recipients”, “Message View” and “Options”. 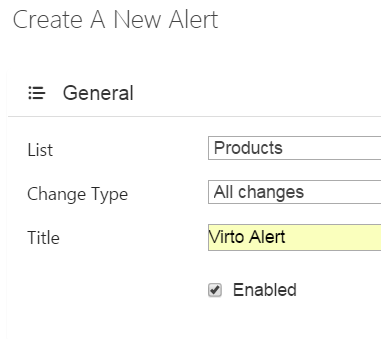 Open “General” tab and select a SharePoint list to create alert for its changes. Fill out the required field “Title”. This is a title of new Alert Subscription. Now point “Enable” or “Disable” status. You can disable subscriptions temporary. In this case alerts will not be created and sent.